Springtime, yay! Amirite? I have so been looking forward to warmer weather and longer days! I'm totally loving it! Now that the strawberry season is starting I'm finding myself buying a few punnets each week. These days I generally eat them plain, or sometimes with chocolate, but this strawberry oat breakfast crisp was a pretty fabulous way of using my weekly strawberry haul. 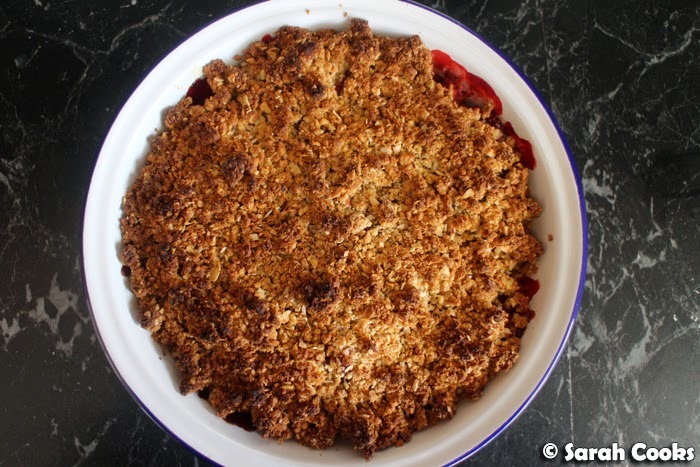 This particular recipe is adapted from Megan Gordon's wonderful book: Whole-Grain Mornings, but a strawberry crisp with an oaty crumble topping is a pretty common recipe. (Check out this Yummly page I came across for further proof!) 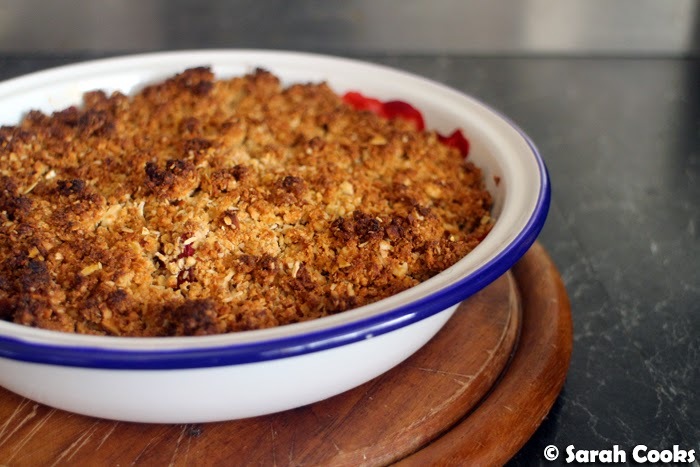 I've seen heaps of variations online - baked in pie dishes like a crumble, in individual ramekins, in skillets, or as bars, topped with ice-cream, and even in raw / vegan / gluten free versions. 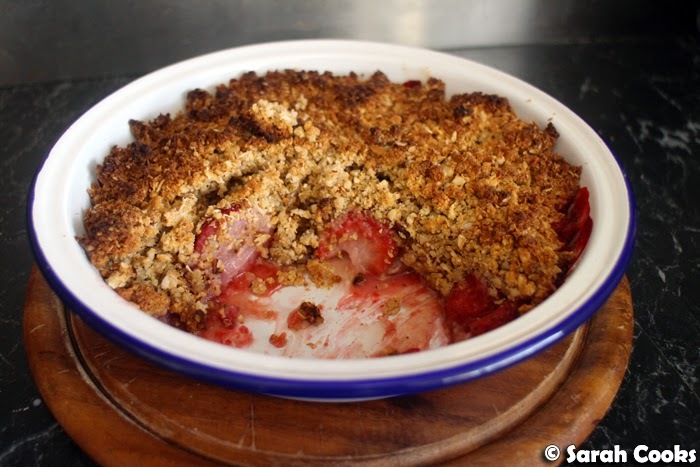 This version is definitely breakfast - it's not overly sweetened, and quite hearty, with whole almonds, almond meal, wholemeal flour and oats in the topping. It is a real treat of a breakfast though! 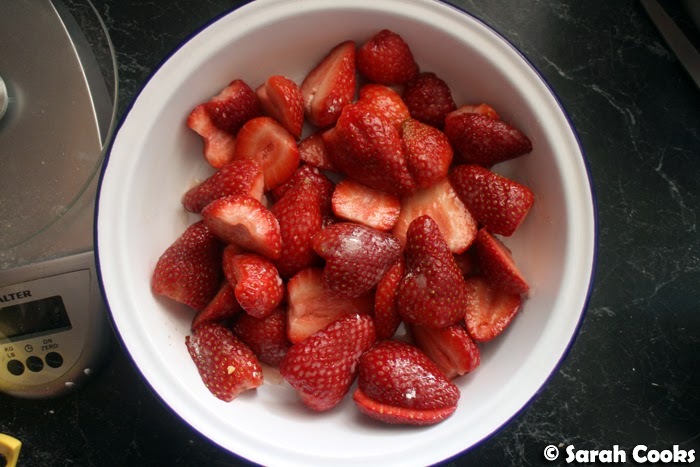 You start with strawberries, washed, hulled and halved, which you toss with a bit of vanilla sugar and cornflour. These gleaming red jewels get tumbled into a pie dish. 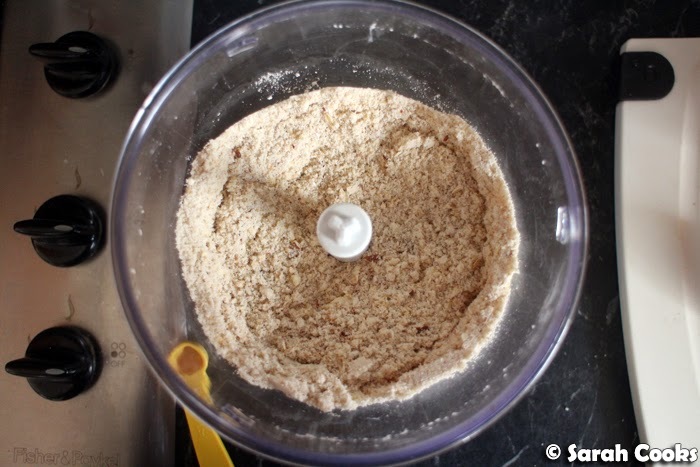 The topping is best made in a food processor - you grind up whole almonds, almond meal, wholemeal flour and oats, with some rich brown sugar, and a touch of baking powder, baking soda, salt and nutmeg. I love the oaty nutty wheaten topping! Some cold cubes of butter and tangy buttermilk help the topping to come together. ...before being baked to a golden crispy brown. The strawberries underneath cook down and bubble up underneath. 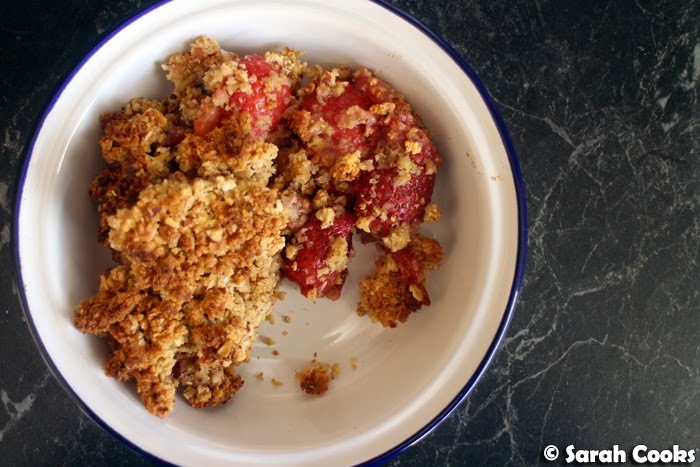 I don't always like cooked strawberries, finding them a bit mushy and bland, but in this recipe they roast in the oven and their flavour is intensified. Totally gorgeous! I like to serve this strawberry oat breakfast crisp with creamy sharp Greek yogurt on the side. Perfect for a springtime breakfast! Enjoy! To make the filling: Wash, hull and halve the strawberries. Toss together with the sugar and cornstarch, and place into a 20 centimetre pie dish. 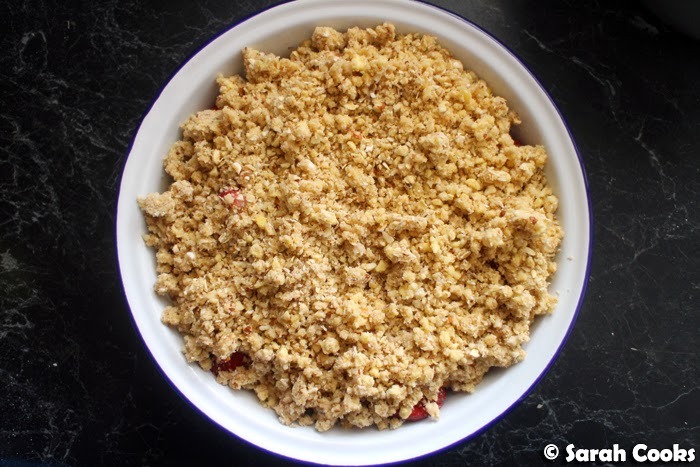 To make the topping: place the almond meal, almonds, flour, oats, baking powder, baking soda, muscovado sugar, salt and nutmeg in the bowl of a food processor. Pulse a few times, just to combine. 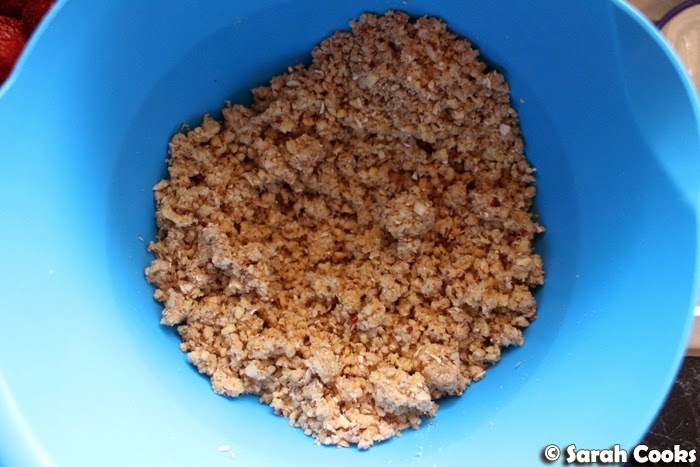 Add the butter and pulse until the mixture resembles coarse breadcrumbs. Add the buttermilk and pulse a few times to combine. Tip the mixture out into a bowl and rub it between your fingertips to make sure it is combined evenly. Pile the mixture evenly over the strawberries. Bake in the preheated oven for 20 minutes, or until golden brown and the strawberry juices are piping hot and bubbling. 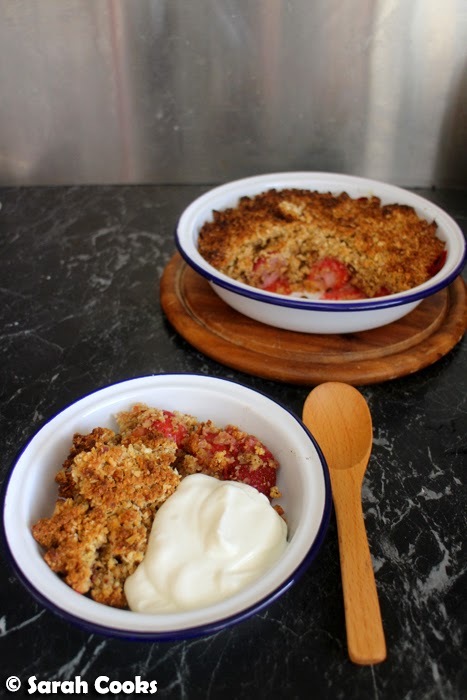 So basically we're looking at a way to eat dessert (strawberry crumble) for breakfast... I LOVE IT!!! definitely made me smile before going out in the morning! Oat crisp says positively virtuous compared to strawberry crumble. lol. Imma having oat crisp every morning for breakfast from now on! I've been having a LOT of strawberries as well - generally just chopped up on top of my oatmeal. I could do with a change though!